The Program’s strategic direction is supported by being locally led and driven, thus working within the Tongan system, and by its commitment to gender sensitivity together with disability and geographical inclusivity. Tonga Skills aligns with national policies and processes and partners with national bodies as well as key private sector partners and relevant government ministries. 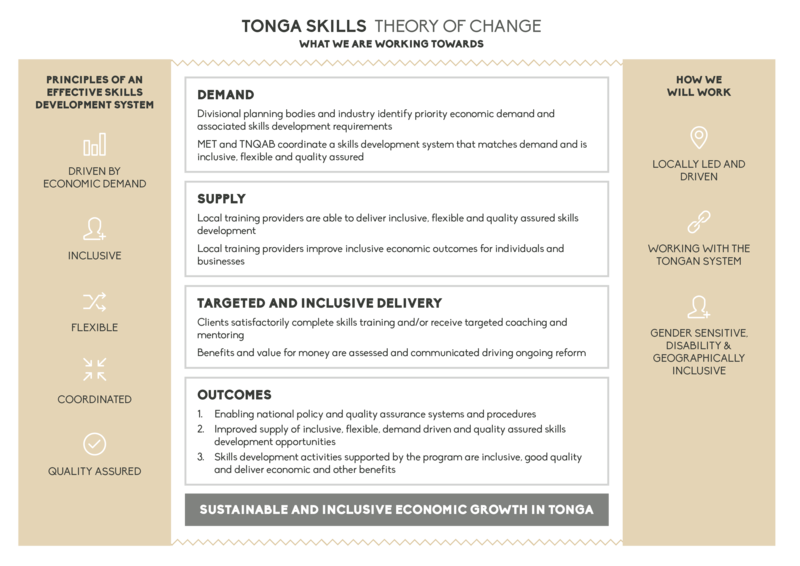 The Tonga Skills Inclusion Strategy focusses on a twin-track approach to assist people with disabilities gain new skills, improve productivity and access new markets. With assistance from the program’s Skills Development Fund residents at the Alonga Centre Tonga in Pea completed a jewellery skills training program. The Alonga jewellers now have a stall at the cruise ship handicraft market at Vuna Wharf free of charge where they can sell their products days and earn income for greater economic independence. Tonga Skills supported the development of a new plumbing training program at the Tonga Institute of Science and Technology (TIST) as part of a comprehensive upgrade initiative. The ). The Australian High Commissioner launched he program and commented on the speed with which the program was developed and deliver commenced. Tonga Skills supported the development of the local handicraft industry through a series of specialist workshops to improve the market competitiveness of Tongan production. Uili Lousi, the world-renowned Tongan designer, was engaged by Tonga Skills to deliver the workshops and coaching to local artisans across the island groups. Tonga Skills partnered with the Australia Pacific Training Coalition (APTC) in the delivery of the International Training and Assessment Course for the first time in Tonga. This internationally-recognised program designed by the Australian Government Department of Education and Training provided an exciting professional development and pathway opportunity for leading and emerging local TVET trainers and teachers, which is customised to the Tongan context. The training is being delivered by Kevin Tabi from Vanuatu APTC campus, who is a well-known expert in vocational training in the Pacific.